Last night I did a trial run of the decoration I plan to use on my niece’s first birthday cake. 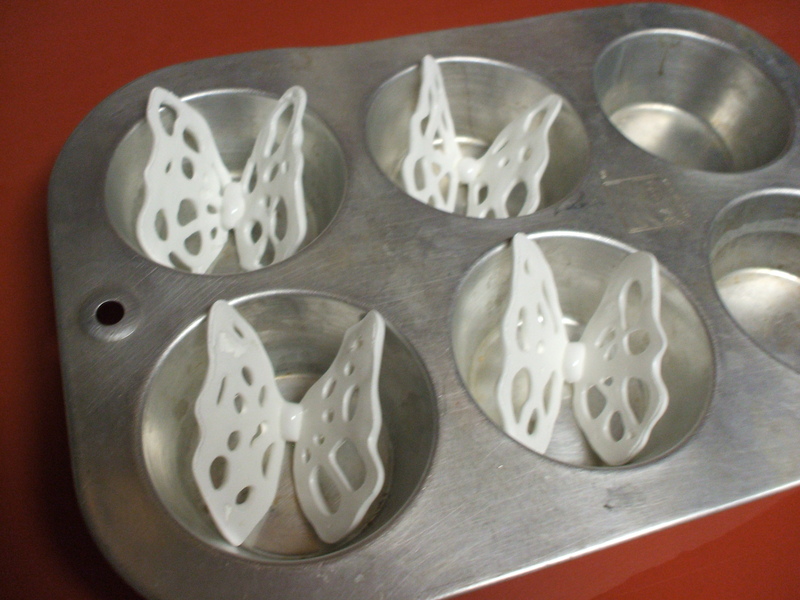 The butterflies are swiss meringue, piped onto parchment with the aid of a butterfly template underneath. I then dried the meringue in a 200° oven for about 25 minutes. Then I delicately broke the wings in two and using a muffin tin to prop them up, I positioned the wings in a “flying” position and then piped a bead of meringue to “glue” the two pieces together and baked for another 10-15 minutes. Things I’ll change next time: thicker lines when I pipe the butterfly design, piping the wings separately, and perhaps piping a thicker, longer body. I’m planning on taking the butterfly wings up north and then assembling and baking the meringue bases just before the party. I think the finished butterflies may be too delicate to travel. I’m also planning to do a lot of the prep work for the cake before we leave Friday as well. The cake is Cook’s Illustrated Strawberry Cream Cake. It seemed like an appropriate and (delicious looking) spring “special occasion” cake. I want to pick up a cake stand for it and then (carefully) cut each slice and decorate with a meringue butterfly.